Written in the 920s. English language translation by Paul Lunde and Caroline Stone published in the UK by Penguin in July 2012. In 922 AD, an Arab envoy from Baghdad named Ibn Fadlan encountered a party of Viking traders on the upper reaches of the Volga River. In his subsequent report on his mission he gave a meticulous and astonishingly objective description of Viking customs, dress, table manners, religion and sexual practices, as well as the only eyewitness account ever written of a Viking ship cremation. Between the ninth and fourteenth centuries, Arab travellers such as Ibn Fadlan journeyed widely and frequently into the far north, crossing territories that now include Russia, Uzbekistan and Kazakhstan. Their fascinating accounts describe how the numerous tribes and peoples they encountered traded furs, paid tribute and waged wars. This accessible new translation offers an illuminating insight into the world of the Arab geographers, and the medieval lands of the far north. I feel very privileged to be able to read such ancient texts as Ahmad Ibn Fadlan's travel memoir and the other writings that make up this volume. 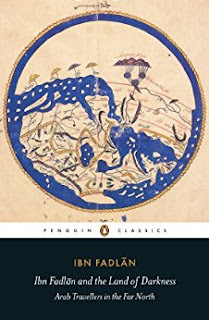 Even in translation - and I think Lunde and Stone have done a brilliant job here - the Arabic travellers' voices shine through and it is fascinating to think that Ibn Fadlan's account was written eleven centuries ago! I was already aware of Danish Vikings invading and settling in the UK and Ireland, but didn't know they had wrought havoc right on down to what is now Portugal and Spain, or that their Swedish compatriots had journeyed east and south into Jewish and Islamic lands. Known to Arabic writers as the 'Rus', these Vikings (who would become Russians) displayed wonderfully outrageous and uncouth behaviour in the eyes of the pious and fastidious Muslim envoy. I could almost imagine Ibn Fadlan's raised eyebrows, but he strives to still record an unbiased and factual account of these strange northern warriors. This Penguin edition would probably be best read as a paper book because its maps are only at the beginning - fine to keep a finger in the page of a paperback, but infuriating in an ebook! My geographical knowledge is well-known to be useless so I frequently struggled to remember where all the various kingdoms and empire boundaries were. As well as Ibn Fadlan's account, we also get to read an account written some two centuries later of similar travels by Abu Hamid al-Andalusi. The lands are much the same, but the ruling tribes and their religious beliefs have changed and this continues through the third section of short writings by a number of other travellers. I found the short accounts hard going by the end as there is extensive overlapping of observations and ideas with some writers 'quoting' (or copying!) their forerunners. Fact and folklore often blend too and there are hints of tall stories starting to come in - were the sled dogs really as big as donkeys? Sounds fascinating. I too had no idea until recently that Vikings had journeyed so far and wide. And I'm glad I saw your review, as I didn't realize this was an actual historical document. I've only been familiar with the Michael crichton book that was partly based on this. I want to read the Criichton now to see his take on Ibn Fadlan! I hadn't heard of this one before now. Sounds interesting though. Vikings are always interesting. It's an amazing window into history! I've never read a translated work that I know of, but it sounds like a really good translation if the original voice still seems to shine through! And the kind of culture clash and how he still tried to stay unbiased makes it sound even more interesting! The translators did such a great job that I frequently forgot I wasn't reading the original language! Vikings were everywhere! The Normans in France (who later invaded Britain) were descendants of Vikings. Amazing weren't they! I need to find more books about this era.